In my experience, a new Neal Stephenson book is good news. There is always something to enjoy in his books that I’ve read (Anathem, Cryptonomicon, The Diamond Age, Snow Crash). I like the way he takes big ideas, fleshes them out, and makes a huge, detailed, and believable world out of them. That’s what he did in Seveneves, a tale in which the human race is mostly annihilated when a mysterious force or object destroys the earth’s moon. As a result of the moon breaking up, astronomers expect that within two years a hailstorm of falling rocks will both pummel and incinerate the earth’s surface. Nations of the world respond by throwing all of their resources into creating a small, self-sustaining space colony built around the International Space Station. The details are believable, the destruction is harrowing, and the effort to survive is equally believable and harrowing. The book is kind of like two novels in one, because we get a full story and travails of the survivors in space for two-thirds of the book, then we get what could well have been split into a second volume. It’s a concluding section in which we peer into a world several thousand years into the future, with another set of characters and its own story arc. I’ll say now that Seveneves wasn’t a favorite of the Stephenson novels I’ve read. Two factors dragged it down for me. The first can be summed in one word: exposition. For stories like this to work, the reader needs enough plausible detail to make the scenario real, but not so much detail that it gets in the way of the plot. Unfortunately, Stephenson chooses to spend pages and pages and pages explaining minutiae of orbital mechanics, the physics of spinning chains, and many other subjects. While a reader may be impressed with the depth of thought with which Stephenson worked out every detail, the reader might be forgiven for sighing and saying, “Here we go again,” when the author launches into another tutorial. The eyes glaze over, the mind drifts off, and awareness returns when the plot moves forward again. The other factor that bothered me was that, for a book that cleaves so closely to science, I found some of the events and outcomes preposterous. That’s not always a barrier in a science fiction book if the setup and characters sweep you forward and bring you along for the ride, but in this case I felt I’d been set up for something pretty straight-edge and relatively plausible. I may be one of the few who have this reaction. I don’t know. Without revealing plot elements, I’ll just say that my problems came in the form of some of the proposed biology, physiology, psychology, and sociology. One small example I can give: I’m not convinced that a self-sustaining ecology could be created in a lot of “tin cans” in space with today’s technology. (Even with a supply of water that the protagonists procure.) The book didn’t convince me that this was possible – it’s one place where maybe I could have used a little bit more explanation so I’d believe it. I think Stephenson is more interested in physics than life science and the “soft sciences.” Maybe because the last book I read was Kim Stanley Robinson’s Aurora, I was more suspicious of the somewhat blithe assumption that we could successfully maintain agriculture in a space habitat. In the latter part of the novel, I was hoping to get a hint of what was behind the destruction of the moon, but that wasn’t forthcoming. Just some vague speculation about fate and “purpose.” It was just a big macguffin. Hold on for the next Stephenson novel, and don’t feel like you’ve missed out on too much if you skip the 880 pages of Seveneves. If you do read it, there is, as I said, some compelling material to be found. When I read the outlines of the story behind Robinson’s book, Aurora, I expected something on the order of his Mars trilogy. That justly famous saga, composed of the books, Red Mars, Green Mars, and Blue Mars, tells the story of nothing less than the multi-generational colonization of Mars. It has memorable characters, and is full of politics, ecology, and economics, as well as technology. Aurora concerns a multi-generational ship bound for a “nearby” star system, to colonize a world there. But this time Robinson had something entirely different and very interesting in mind, and it’s one of the best science fiction novels I’ve read in a while. Spoilers ahead. Like the Mars books, this novel also supplies the likely technology along with some interesting characters and social structures. A big difference is that this colonization project doesn’t quite work. Over the decades, it becomes increasingly difficult to balance the fragile ecology on the ship. Though the destination is finally reached, problems arise there, as well. Some travelers decide to return home, and a harrowing journey awaits them as technological fixes start to fray and social tensions magnify. I suspect the entire book is leading up to a single event back on the Earth. At a scientific conference about star colonization, a somewhat fatuous lecturer quotes the Russian space pioneer, Konstantin Tsiolkovsky, “The Earth is the cradle of humanity, but mankind cannot stay in the cradle forever,” and for this, one of the returnees from the doomed expedition punches him in the face. The book can be like a punch to the reader’s face, because you find yourself rethinking common science fiction tropes, and reality-checking many assumptions along the way. Is It really inevitable that humans move to the stars? Is it even possible? Is the Fermi Paradox really all that surprising? In light of these questions, how critical is it that we maintain the health of our home planet? For long-time science fiction readers, and probably for many others in the nerd-techno culture, this book is subversive. It was fun to read some reviews on Amazon that were complaining along the lines of “What? After all that, they just came back?” or “Well, those people just needed a strong leader to pull them all together and make things right.” In other words, it didn’t have the requisite space battles, important cosmic occurrences, smart aliens, or a heroic captain. It told some hard reality-based truths, which is not what many SF readers are looking for. The book is not perfect. It has some “dead zones” and small problems, but it’s well worth the read. One last note. In the Mars trilogy, an unexpected favorite part involved a description of a lifelong Mars resident coming to Earth for the first time. The description of that person’s sensory overload, his dealing with earth gravity, his wide-eyed descriptions of the lush environment, were terrific. In this book, at first I didn’t like the character of the ship’s AI computer. It seemed a little trite. But I came to enjoy this character as it grew and gradually expressed desires and feelings. In fact, I was fairly transfixed and emotionally moved when, towards the end, it seemed to gain a full-fledged selfhood and a heart. 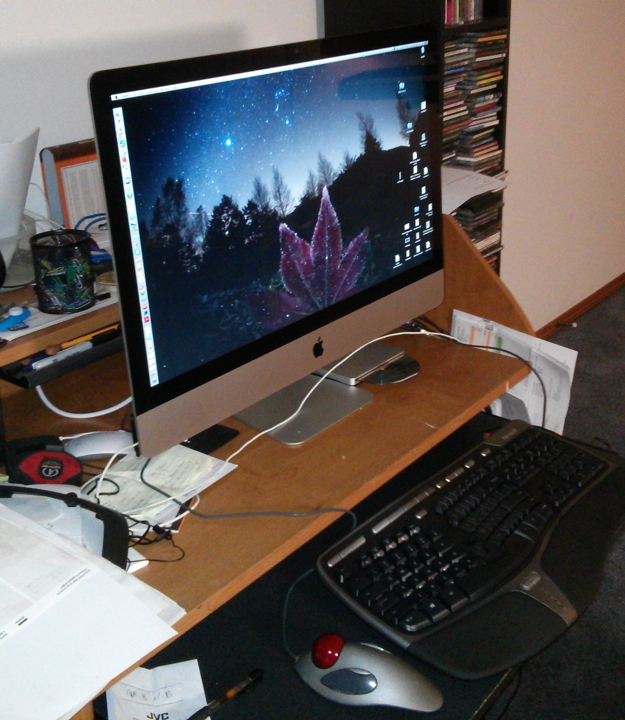 I just replaced my 2006-era desktop iMac with a new one. The old was still working quite well, still had beautiful graphics, and was just barely beginning to show its age. The built-in camera died, the ethernet port stopped working (though I didn’t notice much since the Wi-Fi was operating), and it was starting to feel a bit slow. I could have continued using it for who knows how long. That’s one thing I like about Macs. They tend to last a very long time and be quite useable and not outdated six years later. Great value. No breakdowns, no headaches. Just flawlessly works and works and works, year after year. I did all the initial work on my oracle card project on the old Mac with no problems at all. My new one has a larger screen and will function as my TV. It’s very quiet. It’s fast, sleek, and spiffy, and will remain so for many years if the past is a guide. The bluetooth keyboard that came with my new Mac is perfect for someone with tiny hands. Someone with tiny hands who doesn’t like ergonomics. Someone with tiny hands, doesn’t like ergonomics, and likes to use two separate keys just to get a forward delete function for text. Oh yeah, and someone who doesn’t like to have a page up and page down key. So I had to buy an ergonomic, full-size keyboard, which really should already be provided considering the price. Microsoft makes a nice one, and the audio keys — volume up, down, pause, and mute — all work with the Mac. That’s the Microsoft keyboard in the photo. More money was spent for an optical drive. Sorry, but I have a shelving unit full of CDs and I haven’t loaded all of them onto my computer yet. The computer is my home music player. I also have some DVDs, and I get movies and TV series from the public library on DVD and, as I said, my computer is my TV. Someday this will all be a moot point. Someday all library movies will be streaming or downloads, all of my music will be transferred to servers that go by the ridiculous name of “the cloud,” and one day we’ll have fiber optic cables coming out of our nostrils. Today is not that day. Today is the day Apple and other companies are extracting additional money from us for optical drives. I still love my Nexus 4 Android phone and have no desire for an iPhone. I still love my iPod and have no desire for a different music/podcast player. Sometime in the spring of next year I’m going to replace my old-school Kindle with a new Paperwhite version that’s scheduled for release in the first quarter. I prefer a Kindle to paper when I’m reading something huge like Game of Thrones or the almost complete works of Mark Twain. I don’t need to carry all that bulk around with me. I finished Phil Plait’s new book, Death from the Skies. He hits the twin goals of entertaining and educational and makes it look easy. Running through all the ways the cosmos might kill us, the astronomer manages to pack in a lot of amazing information about the universe. He transmits his own excitement and astonishment with funny asides and sheer exuberance. If you’ve ever heard Phil speak in person or seen him on a video you can’t help but hear his voice as you read the book. Every second, the Sun converts 700 million tons of hydrogen to 695 million tons of helium. The remaining five million tons is turned into energy in this fusion process. Every second! When a massive star explodes (a hypernova) it creates a gamma ray burst that could destroy life on Earth even if the star is thousands of light years away. Not likely to happen to us soon. A fast moving mini black hole with a mass of ten billion tons (smaller than an atom), would pass through the Earth without eating up a great deal matter or slowing down much. My favorite phrase in the book is some variation on, “And then it gets worse!” It comes up over and over again as the author spins out each cosmic disaster. He loves his gargantuan disaster scenarios like the true science (and science-fiction) fan that he is. I’m not saying that science geeks want disasters to happen; they’re just good at creating accurate portrayals. The text contains a galaxy of asterisks with notes at the bottom of the page. Some notes are humorous asides, most are explanatory and helpful. Sometimes he gets a little carried away with these footnotes, but it’s usually from eagerness to include more cool information, so this is easily forgiven. dangblog gives it four mutated thumbs up. I just made up the mutated-thumbs-up scale, but I think this is a pretty good rating.